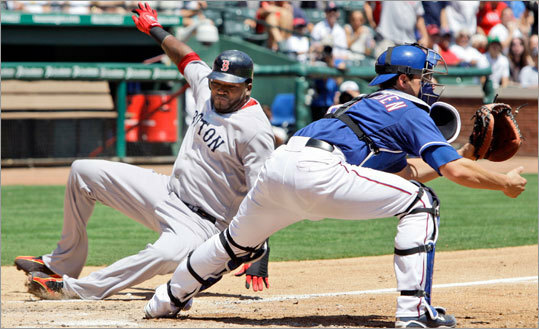 (AP) David Ortiz, left, slides into home plate to score in the fifth, but it wasn't enough to lift the Sox past the Rangers. ARLINGTON, Texas - The Red Sox, despite their recent woes, are not so deflated that they can’t still crack a joke here and there. But the jokes recently have turned to sarcasm, with a hint of desperation. That won’t happen, of course. But the Sox also can see the reality of their position. With their 4-3 loss in front of 27,155 at Rangers Ballpark, the team has gone 12-17 since the All-Star break. Even with the Rays’ recent five-game losing streak, Tampa Bay is just three games behind the Sox. “We haven’t played up to our capability, that’s for sure,’’ Mike Lowell said. “If today was the last game of the season, I think we’d all be crying right now. But we still have a month and a half of baseball left and a chance to turn it around. I think we’ve got to look at it as that. But we can’t keep playing the way we are. We have to improve in more than just one area. That won’t be easy against Toronto (especially with Ricky Romero and Roy Halladay starting tomorrow and Wednesday), nor was it easy against the new-and-improved Rangers staff. A team that long has been known for a great offense and disappointing pitching, the Rangers have put it all together this season, something Bay credited to their pitching coach, Mike Maddux. The Rangers won seven of the nine games between the clubs this season, their best winning percentage (.778) ever against the Sox in a season in which they played at least seven times. But the Sox have to focus on getting themselves together, regardless of what Texas is doing. “There’s still a lot of baseball left,’’ Bay said. “Granted, you would have liked to take the series, but I don’t think anything changes. Not on our end, anyway. We still have a ton of divisional games coming up. Kind of make or break there a little bit, but I think it’s a little too early to start altering your approach. Junichi Tazawa made his second start for the Sox, and the Rangers took advantage of some pitches that were too high, and of a fastball that wasn’t quite spot on. He allowed four runs on 10 hits in five innings plus, and in recent years the Sox might have pasted the Rangers’ pitchers with their own spurt of offense. But Dustin Nippert used his changeup more effectively as the game went on, and this just isn’t the same Sox lineup as in recent years. The Sox left nine men on base. They had men on in every inning except the ninth, and multiple runners in five innings. But they scored just three runs, two on homers by David Ortiz in the second and Dustin Pedroia in the seventh. In the eighth, they had runners on first and second with just one out. Brian Anderson, though, struck out looking on a pitch that appeared low. Alex Gonzalez followed with another caught looking. After an Anderson sacrifice fly produced a run in the fourth, the Sox had runners at second and third with two down and Jacoby Ellsbury at the plate, but he grounded to second. Pedroia had a few words with plate umpire Lance Barksdale after striking out looking in the ninth. The Rangers got a run in the second on an Ian Kinsler homer, his second in as many days. They got two more in the third on a Josh Hamilton RBI double and a Kinsler RBI single. Their last run came on a mammoth Taylor Teagarden homer off Tazawa to start the sixth. Boston is now 28-33 on the road this season. “We don’t want to get into a must-win situation yet,’’ Bay said. “One of those games [in Toronto] Halladay is going, so that’s going to be tough in and of itself, but I don’t think we’re in a must-win situation yet. But a team that’s probably scuffling a little bit lately, we haven’t played very well there, so we need to get the ball rolling at some point.